What if fans and reporters had opted for bowl matchups and school and conference administrators were absent? We would get much juicier games, that's it. How about Florida in Central Florida? The small climber with the massive and growing campus and the enrollment in Orlando against the established SEC giant with a shelf full of national and conference trophies won by college football legends Steve Spurrier and Urban Meyer. They have only played twice and not in a dozen years, certainly not since UCF has become a national brand. What does this matchup not like? Well, the Phoenix business people do not want it, that's what. They would much rather have someone than a couple of schools from a distance of 2,500 miles that would probably bring no more than a few thousand fans. Hey, this is all about TV ratings, not live gate. But OK.
What if the Peach Bowl would make this game? Easy drive from Gainesville and Orlando or anywhere in North Florida. Fans would flock to refill the new Mercedes-Benz stadium in Atlanta. Well, UF honestly does not want to know about it. There is no gain for the alligators. If they win, they should do it. If they lose, especially if UCF plays a back-up quarterback, oh man, Dan Mullen would never hear the end of it. It's a potential nightmare for recruiting. And although the College Football Playoff Committee is now responsible for the construction of New Year's games, I believe they are one-sided when we see such games. Games that the fans love. Games that make sense. 1; the local business people, the conferences, the schools. Something where nobody can be embarrassing. Like Florida-Michigan in Atlanta. And the UCF Louisiana State in Phoenix. Oh boy. I can not wait any longer. The fact is, as college football lovers, we often do not get the bowl games we would most like to see because someone with interests outside of football usually gets in the way. Why am I mention this now? Because there is a Penn State Bowl game that anyone can play to see it. And I bet with you that it will never happen. Who would not like to see the state of Penn State-Mississippi? That's among you fans? Well, would be a game that would inspire you. 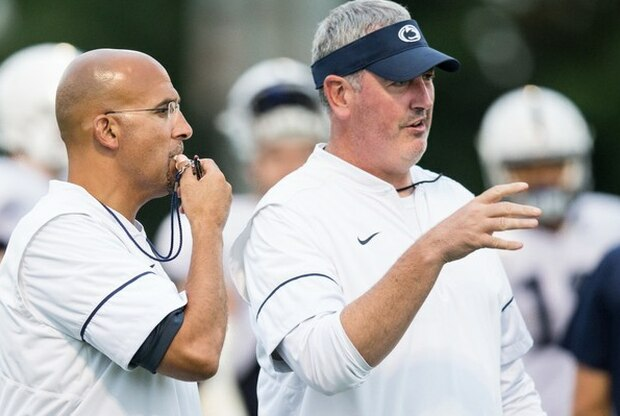 Joe Moorhead against his old boss James Franklin? Trace McSorley in his last game against his old guru? MSU defense coordinator Bob Shoop against his trial fighter, PSU? Are you kidding? What is not to love? Where do we sign up, right? And that's exactly why I do not see it. It could be uncomfortable for the participants. Someone could become restless. We can not have that. The Citrus Bowl in Orlando is in the most logical position to enable this game. Apart from a possible but unlikely series of results on Saturday that could lift Penn State into the Peach Bowl, the Nittany Lions are heading more towards Florida. The Citrus will probably have the first chance. The most famous of the Bowl predictors, Jerry Palm of CBS Sports, has # 12 PSU # 15 Kentucky, a slightly higher rated 9-3 team instead of #. 18 Mississippi State at 8-4. He has Moorhead's Bulldogs at the Music City Bowl in Nashville, where he plays the state of North Carolina. But the Citrus could allegedly demand the Mississippi State, and it would not make a big difference in prestige. It's not that football in Kentucky is filled with tradition. No one I know calls for a rematch of the LaVar Arrington-Tim Couch game, in which PSU gummed the Wildcats to death in Tampa 20 years ago. All I remember from this game is that Jessica Simpson sang the national anthem. Miss State-Penn State would be infinitely more fascinating. How likely is this match? "I would say it's less than 50 percent," Palm said. "Because the Citrus Bowl has in the past favored a team with at least 9 wins. And the only option of that kind would be Penn State-Kentucky. But a few years ago, we saw a Minnesota team with 8 wins in this game [post-2014 season]. "So it's not impossible that this could happen. Of course, the schools would have to be on board. " Ohh, right. Here we go . Let's do that less than 1 percent. You know Penn State does not want to have anything to do with this game. Although PSU fans would absolutely eat it up. So we get a banal bowl that does not tear anyone's feathers. Like Kentucky-Penn State. OK, is there any way to compare the British basketball team with the PSU football team? Before I understood in the 1990s how these kettle combos look and did not happen, I kept seeing the opportunity for Penn State Mississippi State to play in a bowl, awaiting the prospect of Jackie Sherrill and Joe Paterno in have to pretend cordiality to the public. If you imagine how up-graded they would be, they would make their teams beat each other, like in the bitter Pitt-PSU days. It always seemed like it should have happened. No way. Well, there is a reason. Actually more than one. And they are the same they ever were. Especially as the playoff keeps the nation's concentration and inevitably widens at some point, the bowls are always afraid of irrelevance. They do not want to upset the schools or the leagues. They will do everyone a favor, if they can. The coaches only want to go through the dishes with as little statics as possible. They love the extra practices, but it's more work between the already hectic recruiting days. You do not need additional drama. And sports directors and school administrators just want to stay out of the way, keep their coaches happy, and wait for the annual windsurfing conference to fail. What the fans want is less and less worrisome. So, I'm afraid the dream of Penn State-Miss State has to stay that way. The bowls are not for football fans. They serve to secure the truck and to load. They are a recruitment phase. A device for branding schools. For Vegas and their degenerate patrons. They are a product for cable networks that is not necessarily delicious, but filling, like an all-you-can-eat buffet from Golden Corral. And they are a platform for advertisers. Not necessarily dynamic, but plentiful and reliable. Like … the Golden Corral's all-you-can-eat buffet. For whether it's a great game or an observable game, you will see it . In the Bowl season, you have to refill your football.